Chicken wrapped in salty prosciutto with crispy fried sage served in a lemon caper sauce that is just bursting with flavour without all of the calories. With January here I have been thinking about ways to eat lighter but of course I am not willing to sacrifice anything in the way of flavour! When contemplating dishes that are full of flavour one of the first that comes to mind is saltimbocca , an Italian dish where meat is topped with sage and prosciutto, which is just packed full of flavour! Although saltimbocca is typically made with veal the chicken version is also really good and it is so simple to make that you can easily do it on a week night! 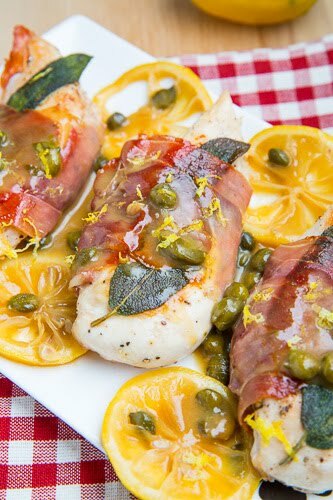 This dish is as easy to make as cooking the chicken until both the sage and prosciutto is nice and crispy and then making a quick lemon pan sauce which adds even more flavour and capers are sometimes added to the sauce. 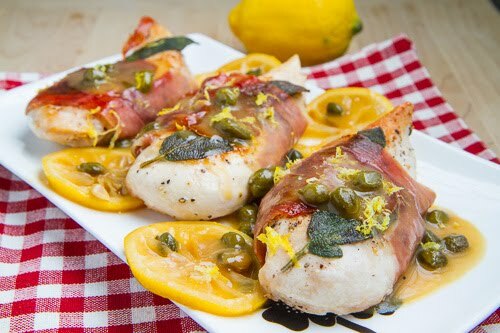 If you are looking for a way to eat a bit lighter without sacrificing any flavour, this chicken saltimbocca is definitely a tasty way to go! Note: Another version of saltimbocca, called saltimbocca alla Romana, is made by rolling the sage and prosciutto up in the meat but I like the simplicity and easy of just wrapping the chicken up with the prosciutto with the sage leaves underneath. 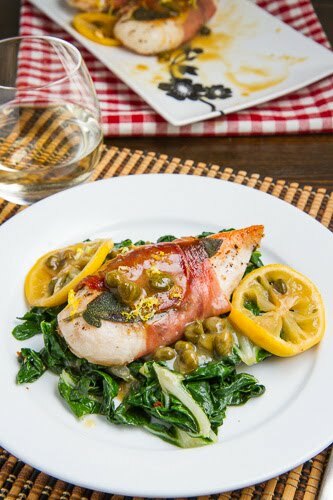 To keep things on the healthier side I served the chicken saltimbocca on a bed of simply sauted swiss chard which collected all of the extra tasty lemon and caper sauce. Season the chicken in salt and pepper and wrap in the prosciutto securing 2 leaves of sage between the prosciutto and each chicken breast. Heat the oil in a large pan over medium heat, add the chicken and cook until the prosciutto is crispy and the chicken lightly golden brown and cooked, about 2-4 minutes per side and set aside. Add the wine and deglaze the pan, add the chicken broth with the cornstarch mixed in, lemon juice and capers and simmer until reduced by half, about 4-6 minutes. Add the butter and cook until melted and the sauce thickens a bit, about 1 minute. Server the chicken topped with the lemon sauce. Looks like an easy and yummy recipe. Will cook this tonight…. ANYTHING with proscuitto on it is good in my book!! Love this dish! I love saltimbocca but have only ever had the veal version…great idea to make it with chicken. Delicious! Happy New Year to you. This looks fantastic and I love that it's figure-friendly! Thanks. I am sure many will benefit. Please do visit http://www.fashionablefoods.net too..
Josh will love this one! I need to make more skinny recipes. You are way ahead of me Kevin! Kevin, Just wanted to give you a heads up that all ( at least the three that I tried) of my pins from the closet cooking site have been blocked by Pinterest! You have my favorite cooking blog and I have tons of your recipes on my boards…so I hope this gets fixed! Light and this delicious-um yay, bookmarked! I made this tonight and my husband said we will definately have this again! Delicious and so easy to make, what more could you want! You really out did yourself on this one, Kevin! Delicious, easy and elegant. Veal Saltimbocca is one of my favorite things to order in a restaurant. I will definitely try this. How did you do the lemon slices? They make the dish look SO fresh! Chicken saltimbocca is one of my favorite Italian dishes (and I never eat it with veal). I think wrapping rather than rolling is a much prettier (and simpler) presenation too. I like your use of capers. I would not have thought of it. Anonymous: I just place the lemon slices into the sauce as it simmers. Made this tonight, it was fantastic!! I had it with homemade ricotta gnocchi, great combination, with sauted spinach. Thanks for your wonderful recipes!